Comins, Neil F. What If the Moon Didn't Exist? Voyages to Earths that Might Have Been . HarperCollins 1995. Summary: Ten essays on different Earths, five of which involve an altered early solar system and might be considered allohistorical. These are "What If the Earth Had Less Mass? Petiel", "What If the Earth Were Tilted Like Uranus? Urania", "What If the Moon Didn't Exist? Solon", "What If the Moon Were Closer to the Earth? Lunholm", and "What If the Sun Were More Massive? Granstar". Series note: Sequel is What If the Earth had Two Moons? Comments: For comparison, see Arthur Upgren's w88 android. Published: HarperCollins 1993 (0060168641BUY), 1995 (0060925566BUY). Comins, Neil F. What If the Earth had Two Moons? And Nine Other Thought-Provoking Speculations on the Solar System . St. Martin's 2010. Summary: Ten essays on different Earths and solar system, four of which might be considered allohistorical. These are "What If the Earth Had Two Moons? Dimaan, Lluna, and Kuu", "What If the Earth Were a Moon? Mynoa and Tyran", "What If the Moon Orbited Backwards? Anillo", and "What If the Earth's Crust Were Thicker? Dichron". Each begins with a short fictional narrative which in some cases furthers this comclusion. Series note: Sequel to What If the Moon Didn't Exist? . Published: St. Martin's 2010 (0312598920w88 androidBUY). Comins, Neil F. "What If the Earth Had Less Mass? 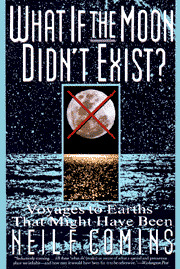 Petiel"
Published: In What If the Moon Didn't Exist? Voyages to Earths that Might Have Been , q.v. Comins, Neil F. "What If the Earth Were Tilted Like Uranus? Urania"
What if: Earth's orbit had an obliquity of (near) 90°. Summary: Life would have had to evolve in the tropics, and when species moved on to land, mass migrations over vast distances would be necessary to avoid death in the alternately baking/freezing mid-latitudes. — Revision of an article in Astronomy , July 1992. Comins, Neil F. "What If the Moon Didn't Exist? Solon"
What if: Earth was never struck by the huge planetismal that became the moon. Summary: Evolution would have progressed more slowly because of the greatly reduced tides and the faster winds. — Revision of an article in Astronomy , February 1991. Comins, Neil F. "What If the Moon Were Closer to the Earth? Lunholm"
What if: A combination of factors resulted in the modern lunar orbit having a radius of only 100,000 km. Summary: Life would evolve more quickly, but face more difficulty making the transition to land. Comins, Neil F. "What If the Sun Were More Massive? Granstar"
— Revision of an article in Astronomy , May 1992. 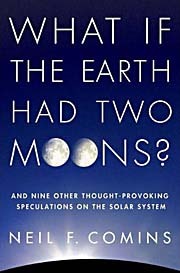 Comins, Neil F. "What If the Earth Had Two Moons? Dimaan, Lluna, and Kuu"
What if: The Earth gained a second moon by capturing a passing body. Published: In What If the Earth had Two Moons? And Nine Other Thought-Provoking Speculations on the Solar System , q.v. Comins, Neil F. "What If the Earth Were a Moon? Mynoa and Tyran"
Comins, Neil F. "What If the Moon Orbited Backwards? Anillo"
Comins, Neil F. "What If the Earth's Crust Were Thicker? Dichron"